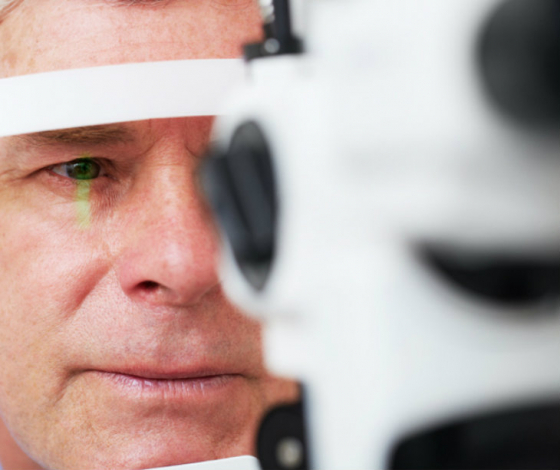 Cataracts is a common eye condition in the majority of people over 65 in the UK but how much do you know and understand about this condition? If you were to be diagnosed with it what treatments are available? In this article, we provide an overview of the condition from the signs and symptoms too how a professional will diagnose the condition and what treatment options are available. Cataracts are what happen when the lens of the eye gradually becomes cloudy, loses transparency and impairs vision. They are very common around the world – causing half of blindness and a third of all visual impairment (according to the WHO). Cataracts are prevalent in all cultures as they are a by-product of the ageing process, the majority of people over 65 in the UK are affected by cataracts. Cataract surgery is the most common procedure in the UK and is a relatively straightforward operation. The reason cataracts afflict so many people worldwide is simply due to lack of access to surgery, rather than the severity of the condition. Cataracts can also happen as a result of trauma, radiation, and genetics. They can also occur in children, however, this is far less common – affecting only three or four children in every 10,000. Signs and symptoms of Cataracts. Cataracts develop gradually over the years and sometimes they go unnoticed as the vision deteriorates so slowly. While cataracts are not painful, they will affect your eyes in several ways – sometimes one eye will be worse than the other, but usually both are affected. Glare or a ‘halo’ effect when looking at lights. Frequent changes in your glasses/contact lenses prescription. In children it may be harder to detect cataracts, as they have trouble articulating what is wrong with their vision. Signs may include a greyish or white area in the eye – although usually these are invisible without specialist equipment. A child may develop a squint (also known as strabismus) because of a cataract, but squints are not uncommon and are also caused by problems with eye muscle coordination. Ageing is the primary cause of cataracts, over time the proteins in the lens of the eye start to change and lead to the lens becoming cloudy, whereas typically it would be completely transparent allowing light through. Although they are an inevitable part of the ageing process, there are several things that can increase your risk of developing cataracts. Genetic. If you have a family history of cataracts, you are at higher risk. Corticosteroids. Consuming large amounts of corticosteroid for a long time increases the risk of cataracts. Eye injuries or conditions. Trauma to the eye can cause a swelling of the lens, which leaves behind a misty colour, this may also be a complication of eye surgery. Eye conditions like uveitis – a swelling of the middle part of the eye – can also increase your risk. Lifestyle factors may also be related to the development of cataracts, such as excessive alcohol consumption, a poor diet, and exposure to sunlight. It is also highly likely that smoking increases the probability of getting cataracts. The Retina – This is a layer of cells at the back of the eye that work by sensing light and colour before converting them electrical signals. The lens works by evenly refracting light and focusing it onto the retina, letting you see objects clearly. With objects of different distances, the lens is able to change its shape to bring them into focus depending on how far or near they are – if the objects are far away the lens flattens, while if the objects are close the lens becomes round. The lens is also surrounded by a muscle that helps it change shape, contracting or expanding depending on the distance of the object you are looking at. As you get older the lens becomes less able to change shape making it difficult to focus on objects close to you. This is a refractive error called presbyopia and has to be corrected with reading glasses or contact lenses. When you have cataracts, the lens is cloudy rather than clear and so light does not enter properly. Proteins in the lens of the eye ‘clump’ together and enlarge over time, creating cloudy patches. Visual Acuity. Using an eye test chart with lines of random letters that decrease in size, you are required to read as many lines down as you can, the smaller you can read the better your eyesight. This will determine how severe the effect of cataracts or other conditions have been. Slit Lamp Test. Using a powerful light – ‘a slit lamp’ a doctor will illuminate your eye allowing them to see clearly any damage or changes. A special microscope is used to see each section at the front of the eye, meaning doctors can see even the smallest abnormality. Retinal Exam. Also known as an ophthalmoscopy, this lets a doctor see the structures at the back of the eye to check the health of the retina and other key components. It may be necessary to dilate your pupils so they are as wide as possible. This will be done using eye drops and can make your vision blurry for a few hours afterwards. If cataracts are having only a minimal effect on your eyesight, a doctor may seek alternative treatment before recommending surgery. You will need to discuss with them the alternatives and how much the loss of vision is affecting your quality of life in terms of mental and physical health. In adults who are suffering from age-related cataracts, the deterioration of eyesight will be gradual. This means that in the early stages the cloudiness should not be any serious hindrance to daily activities The use of bright lights or appropriate glasses should be enough to counteract the effects. As the condition worsens and it starts to impede on things such as reading and driving, then surgery is the only effective treatment. For children with cataracts it is often the case that vision is not severely affected – however if it is, they will also need to have surgery combined with eyeglasses or contact lenses to improve vision. Before surgery you will be thoroughly assessed by your eye doctor to check things like your general wellbeing, the health of your eyes (i.e. are there any other eye conditions complicating things) and the severity of your cataracts. They will also measure your eyes to determine the curve of the cornea and the size and shape of your eyes, this is to determine the strength of the replacement lens that needs to be implanted. If you need cataract surgery in both eyes, they will be done separately and a couple of months apart to give the first eye time to heal. The surgery lasts less than an hour and is usually done with local anaesthetic - where only the eyes are numbed and you remain awake during the procedure. Children will typically be given a general anaesthetic. The most common procedure for treating cataracts is called phacoemulsifcation, it involves several steps and uses ultrasound to emulsify the lens. The eye is numbed with an anaesthetic, administered via injection or using eye drops. Incisions are made in the cornea, so that instruments can be inserted through it. A probe will be inserted and ultrasound waves will be used to blast the cloudy lens into small pieces. These pieces are then emulsified and the liquid is sucked out. The outer layer of the cataract is sucked away. A replacement plastic lens is injected through the hole in the cornea and placed into the area where the original lens previously sat. 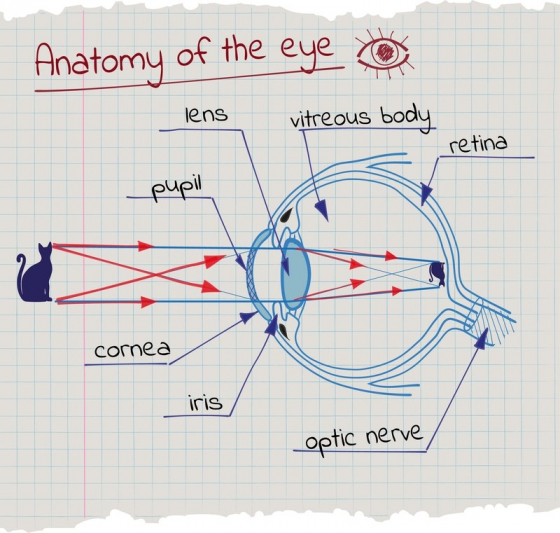 The artificial lens that replaces the original is called an IOL (intraocular lens). They work in the same way as the original lens – focusing light that enters the eye onto the retina, where it’s transmitted to the brain via the optic nerve. The lenses are small, flexible and foldable and made of usually silicone or acrylic, they are tailored, much like contact lenses or glasses, to fit your particular prescription. 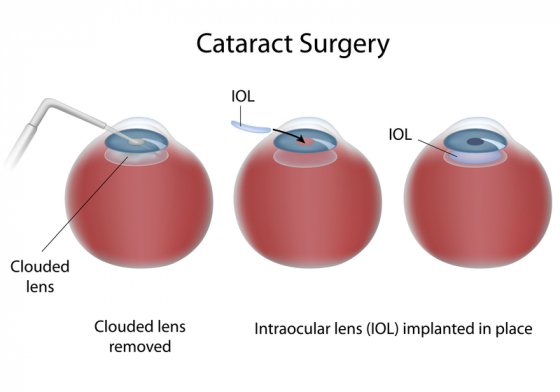 Monofocal lenses – These are set for one level of vision and are the most commonly used IOL. They typically mean a user will be able to see longer distances but will need reading glasses for closer objects. Multifocal lenses – Set for multiple levels of vision, allowing the user to focus on near and far objects. Accommodating lenses – Similar to multifocal lenses, they use a process called accommodation to improve near vision. Monofocal lenses are normally used for NHS cataract surgery, while multifocal or accommodating lenses may have to be acquired privately. Cataract surgery is usually an outpatient treatment, so you can return home the same day. Recovery is relatively short – you should regain feeling in your eyes within a few hours and it will take a few days to a week for your vision to return fully. For at least a few days after surgery, you should avoid any strenuous activity and try to rest, avoiding things like sport and work. You should be able to read and watch TV, but it depends on how quickly your eyes recover. If you are still waiting for your second eye to be operated on this will limit what activities, you are able to do. You may experience moderate side-effects like headaches, discomfort in the eyes or blurred vision. However, if you suffer anything more serious like loss of vision, severe pain or streaky, ghost like sensations in your vision, you should get in touch with your doctor or hospital immediately. Cloudy vision. The most common complication of surgery, it affects less than 1 in 10 people who are operated on. This occurs because the part of the eye where the artificial lens sits becomes clouded over due to swelling. It can be corrected with laser eye surgery, which is usually successful. Tearing of the lens capsule – the part of the eye that houses the lens. Incomplete removal of the cataract. Inflammation or swelling of the retina. Other very rare complications include retinal detachment and eye infections. The majority of people who experience cataract surgery will need to wear glasses afterwards because as previously mentioned, monofocal lenses only focus on a fixed distance. Generally people who have reached the age to need cataract surgery are quite likely to need reading glasses anyway. The use of multifocal or accommodating lenses may reduce the need for glasses, but they are not routinely available on the NHS.